As of June 30, Apple officially discontinued MobileMe, the company's previous suite of online services that has been replaced by iCloud. But while the MobileMe services went offline as of that date, the company has continued to allow MobileMe users to migrate their accounts to iCloud and to download Gallery photos and iDisk files "for a limited time". It now appears that the "limited time" is rapidly running out, and users who have yet to save their MobileMe data and/or convert their accounts to iCloud need to move quickly to ensure that they do not lose their data and registered user names. As noted by Ben Guild, Apple support staff indicated to him that as of the end of the day today Apple will begin shutting down those accounts that have not been migrated, beginning the process of opening those user names up to new users registering for iCloud. We contacted Apple support staff to confirm the timing on the transition and were told a slightly different story, with the representative informing us that Apple would begin taking the old MobileMe servers offline as of the end of the day tomorrow. Some users' data could continue to be available after that time as Apple works through the process of purging all of the old MobileMe data, but users wishing to save their data and claim iCloud accounts with their MobileMe user names do need to move very quickly in order to ensure continuity. Users who have already converted their MobileMe accounts to iCloud will be able to continue using the me.com versions of their email addresses, although the company is rolling out icloud.com equivalents to give users the option of changing domains. 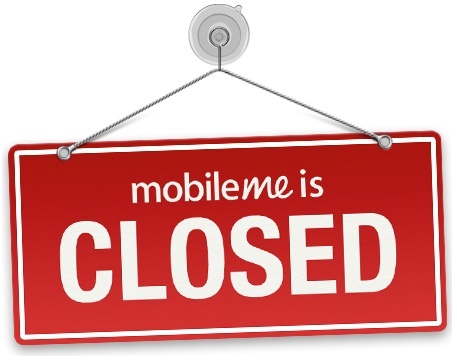 Apple's final discontinuation of MobileMe services comes as the company is also shutting down its beta iWork.com service at the end of the day today. Apple has sent out several reminders warning iWork.com users that they must save any uploaded documents before the service is discontinued, and the support representative we spoke with today indicated that users should not rely upon a grace period for retrieving those documents after today. I know I don't need iDisk anymore because Apple has told me so. I've asked them if I'm still allowed to miss it but they haven't replied yet. I won't miss the yearly fee but I already miss Gallery and iDisk! Graphics like these always make me want to crack open Photoshop, so I did. Oh my... look at the detail on the sign! Its beautiful!! MobileMe now joins the G4 Cube, the Puck Mouse, and the Newton in the depths of the Apple Underworld. Bye, bye! We won't miss you. Next up on the list: Ping! Users who have already converted their MobileMe accounts to iCloud will be able to continue using the me.com versions of their email addresses, although the company is rolling out icloud.com equivalents (https://www.macrumors.com/2012/07/16/apple-rolling-out-icloud-com-email-addresses-with-ios-6-beta-3/) to give users the option of changing domains.